parents access quality child care so that they can attend college or succeed in the workplace. 90% of a child’s brain is “hardwired” before the age of 5, setting the groundwork for future learning. 40% of a low-income family’s budget can easily be spent on child care (average cost in Atlanta is $9,284). 26% of children in Georgia live in food insecure homes, and more than 24% live below the poverty level. By age 3, there is a 30 million word gap between children from the wealthy and poor families. Creating equity and paving the way for two generations to succeed. 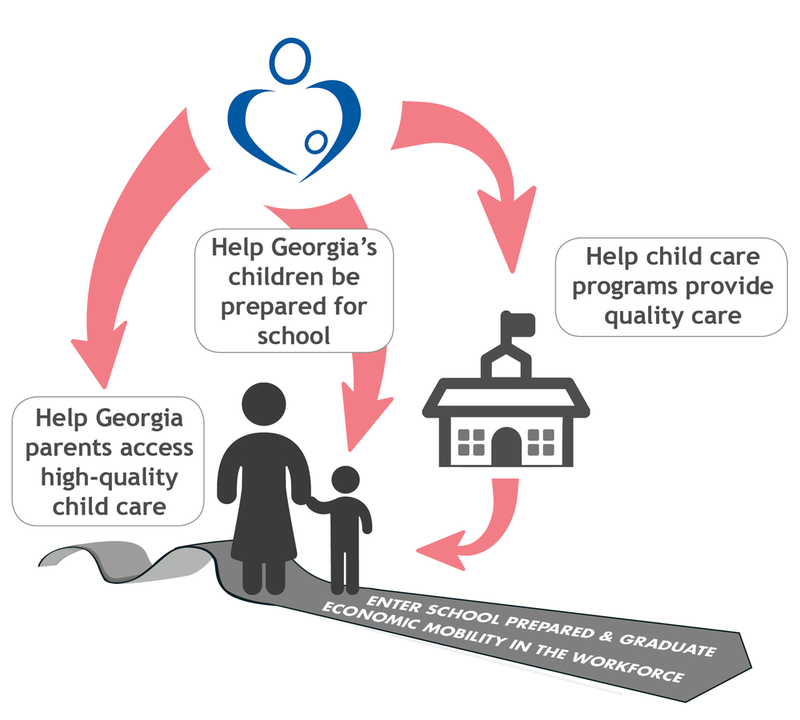 QCC’s comprehensive approach involves working directly with Georgia’s children, parents, and child care providers. The data and findings from the organization’s programs is then leveraged to advocate for policies that promote child care quality and affordability at the local, state, and national levels. QCC provides a free state-wide child care referral service for parents seeking child care, after school programs, and summer camps. The organization’s Referral Specialists help parents understand all of their options to find them programs that fit their family’s needs. QCC offers in-person and online training classes for child care professionals as well as Child Development Associate (CDA) Credential™ courses. Additionally, QCC provides state-wide nutrition training for child care cooks. QCC is a sponsor for the USDA Summer Food Program. This program helps address the “meal gap” problem with many children who receive free or reduced-price lunches in school not having access to nutritional meals during the summer months. QCC administers the USDA Child and Adult Food Care Program (CACFP). The ACFP supports programs that demonstrate a commitment to good nutrition by helping offset the cost of serving higher quality meals and snacks. QCC manages a cohort of Early Head Start family child care providers that serve children of low-income families. QCC staff assists with all aspects of running these programs to provide comprehensive child and family services birth through age 3. Quality Rated is Georgia’s quality rating improvement system created to assess, improve, and communicate the quality of early care programs. QCC provides on-site consulting at child care programs to support their quality improvement efforts. The Provider Resource Hub (formerly the Georgia Alliance for Quality Child Care) membership program provides child care professionals with administrative and cost-saving resources as well as workshops to help them run their programs more effectively and efficiently. The Boost Child Care Assistance Initiative provides child care tuition scholarships to low-income college student parents who cannot afford quality child care but do not receive a child care subsidy in Georgia and also advocates for policies that strengthen access to high-quality care. The Emergency Child Care program assists families who are experiencing crisis situations by helping them pay for child care and developing a long-term care plan. Family crisis situations often include domestic violence, hospitalization, and job loss. Through Georgia Parent Power, parents can receive two free informational mobile messages each month by simply texting “GeorgiaParent” to 99000. Messages cover helpful topics such as developmental milestones, child care quality indicators, and literacy tips.